I had signed up to do a talk at the Summit regarding mochitest manifests and while tossing around ideas (latest presentation) with my team I realized one huge advantage is the time all developers can save by rearranging our list of tests we run for mochitest. I know that isn’t too clear, but my talk didn’t make the cut so this blog post will introduce you to the concept. This is not the most useful manifest as there is limited support for input conditions, but it works. We have other great formats available and there has been great discussion around this topic in other blog posts. In general the consensus is keeping something like the reftest manifest format and extending it as needed. I don’t think it is productive to argue about formats as implementing a parser is a trivial task and hashing out the details of syntax can be resolved much later. What I want to focus on is the problems outlined above and how we can solve them. I had done some preliminary work on filtering mochitests for remote testing. This is sort of a partial implementation of a manifest. My work there was using a JSON format which I would not recommend due to the frustration I experienced editing it by hand. 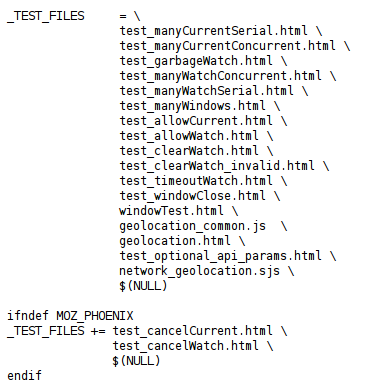 The concepts I implemented gave light to the value of using tags and other metadata in our tests. This works great for solving the Fennec and Electrolysis problems, but doesn’t do much for grouping tests by dependencies (like d2d and oop which need preferences set.) It hints at a lame method to address the orange problem. There a many ways to solve this. One method is cascading manifests that overlay each other. Not ideal for maintenance, but that concept is useful for supporting all tests which we need to temporarily disable when running on an Electrolysis build. 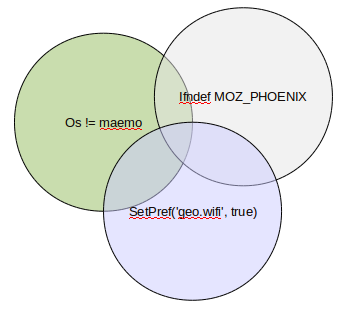 Another method is more complex tagging. This could get cumbersome with 5 or 6 grouping definitions, but it would give the most flexibility and granularity. Whatever the final solution is, I would prefer that it has little to no logic in Makefiles and inside the specific tests themselves. To be complete, we could create a new test type orange ‘or‘ so we would have ‘Mo(1 2 3 4 5 oth or)‘. This would help prioritize any test failures that are seen during a test run. We could give top priority to 1-5,oth failures and lower priority to ‘or’ failures. This is the shift in test lists that I was talking about at the beginning. This concept of an orange suite starts to touch on the output part of the manifest where we can define metadata based on the output or results of the test. By doing this it would reduce the time running and investigating tests locally and on try server saving a lot of time for everybody. This post should outline the problems we can solve with manifests and how we can utilize manifests to solve these problems. If these topics and ideas sound interesting, unreasonable, half baked or otherwise thought provoking, please find me this week at the Summit and let me know what you are thinking about. As for the biggest problem of personal hygiene, it should be obvious that the time saved with the orange test suite must be used for showers, food, haircuts and laundry!